Brussels is a city which is highly segmented on both the social as the cultural level. This diversity is also reflected among the youth. In this article we present the results of a survey undertaken among the last year students of the francophone schools of the city of Brussels. The survey, which focusses on life styles, racism and insecurity, confirms the multifaceted character of the Brussels youth. Important sources of diversity and division are social background, ethnic origin and school choice. Our findings attest that the relations amongst young people are built on identities that are rooted in references to socio-economic class and ethnic origin, while their intensity varies with the type of education. The ethnicisation of the young people’s social relations seems to be very widespread. The survey attests to a paradox: racist insults are quite common, and are not only oriented towards ethnic minorities, but at the same time almost everyone supports the dominant antiracist discourse. Bruxelles est une ville fortement segmentée socialement et culturellement. Cette diversité se retrouve particulièrement au niveau de sa jeunesse. Cet article propose l’analyse d’une enquête par questionnaire réalisée auprès de rhétoriciens des écoles francophones de la Ville de Bruxelles, de toutes les formes d’enseignement, portant sur les styles de vie, le racisme et l’insécurité. Les résultats confirment la pluralité de la jeunesse. Trois variables essentielles semblent différencier les « jeunesses bruxelloises » : l’origine sociale, l’origine ethnique et l’orientation scolaire. Les résultats attestent que les relations entre les jeunes se construisent sur des bases identitaires s’ancrant dans la référence à l’appartenance sociale et à l’origine ethnique mais dont l’intensité est variable selon la forme de l’enseignement. L’ethnicisation des rapports sociaux parmi les jeunes paraît très présente. L’enquête révèle un paradoxe : les expressions xénophobes, qui ne visent pas que les personnes d’origine étrangère, sont nombreuses dans les modes de désignation d’autrui alors même que l’adhésion au discours antiraciste semble dominante. Brussel is een sociaal en cultureel sterk gesegmenteerde stad. Die diversiteit weerspiegelt zich ook bij de jongeren. In dit artikel presenteren wij de resultaten van een schriftelijke bevraging bij de laatstejaars van de Franstalige scholen van de stad Brussel, aangaande levensstijlen, racisme en onveiligheid. Uit het onderzoek blijkt dat de Brusselse jeugd intern sterk verdeeld is naar sociale herkomst, etnische origine en schoolkeuze. Onderlinge verhoudingen zijn vaak identiteitsgeladen, waarbij sociale herkomst en etnische origine een belangrijke rol spelen. De intensiteit van identitaire spanningen is echter minder uitgesproken in het algemeen vormend onderwijs dan in het technisch en beroepsonderwijs. De etnicisering van sociale verhoudingen - het benadrukken van etnische verschillen, ten koste van gelijkenissen en verschillen op andere vlakken - lijkt onder de jongeren sterk aanwezig te zijn. Het onderzoek wijst ook op een paradox: racistische uitlatingen, die overigens niet alleen allochtonen als doelwit hebben, zijn wijdverspreid, terwijl zowat iedereen tegelijkertijd het dominante antiracistische discours onderschrijft. 1In a city as segmented as Brussels, with its layer-cake neighbourhoods of residential, social, and ethnic segregation (Kesteloot, Vandermotten et al., 2001; Jacobs and Swyngedouw, 2000), it is particularly interesting to study young people’s social relationships with each other, especially at school, which is assumed to be a social area that brings together people of various backgrounds. We thus conducted a quantitative survey of secondary school pupils in the French-speaking schools of Brussels in March 2006. The questionnaire, which concerned lifestyles, racism, and fears of crime, was given to 646 students enrolled in thirteen of the fourteen secondary schools in the French-speaking network of Brussels’ central borough, that is, “Brussels-City” or downtown Brussels1. This sample was fairly representative of the students in this educational network, given that it covered more than two-thirds of the students enrolled in the various forms of secondary education (general, technical, vocational, and artistic) of the francophone schools led by the municipal government. However, it cannot claim to be representative of “Brussels youth”, given the selective enrolment mechanisms that exist in secondary education, especially in the Brussels Region. Despite this limitation, this survey gives some insights into the diversity of the different “layers” of Brussels youth according to at least three major variables: social background, ethnic background, and type of schooling. Of the multitude of data that we obtained we have chosen to concentrate in this article on a few subjects for which the outcomes proved particularly unexpected, especially when it comes to racism and crime (or the fear of crime). The following analyses are valid only for the sample of young people who were surveyed, of course. Extending their relevance to the city’s young people at large would require more extensive research2. 2Of the 646 students surveyed, 434 were enrolled in general education (67.2%), 154 in technical or vocational education (23.8%), and 58 (9%) in artistic education. The sample contained more girls (56%) than boys (44%). The proportion of girls was higher in general education, whilst that of boys was higher in technical and vocational education. Although the great majority of the participants (70%) were between 17 and 18 years old, the sample also included some older students (16% were 19 year olds, 8% were 20 year olds, and 5% were 21 years old or older). The overwhelming majority of the pupils in technical and vocational education were older than 18. These age gaps are explained in particular by these pupils’ scholastic careers, especially by repeating years and changing orientation, which is more frequent in technical and vocational education. The great majority of the students lived in families in which the parents were married (61%) or lived together out of wedlock (5%). The parents of 16% and 10% of the students were divorced or separated, respectively. Finally, one or both of the parents of 6% of the students were deceased. The number of siblings differed greatly: 14% of the students were only children, whereas 39% had one sibling, 23% two siblings, 9% three siblings, and 14% more than three siblings. The pupils in technical and vocational education were more likely to come from large families, and this relationship was statistically significant3. Inversely, the percentage of single children was higher in general education. The overwhelming majority of the students (84.4%) had their own rooms. This situation was more frequent, however, for the students who were studying fine arts (94.7%) or in general education (88.2%) than for the ones in technical and vocational schools (70.1%). In the group of students living at home with two parents, those who were in general education were less likely to live in flats (26.6%) than the ones in technical and vocational education (38.6%). Similarly, the parents of this first group were less often in rented accommodations (18%) than the parents of the second group (35.7%). 5 Cramer’s V = 0.153, (sign. <0.001). 3The sociology of education revealed the link between socio-economic class and type of schooling long ago. We tried to test this relationship by using four separate variables, namely, a subjective definition of one’s social status, the parents’ levels of education, the father’s profession, and the family’s overall affluence. Most of the students (63%) considered themselves to belong to the upper middle class. The others considered themselves to be lower middle class (27%), upper class (6%), or lower class (3.9%)4. The young people in technical and vocational education identified more with the lower middle class, and this difference was significant5. Examination of the other indicators of socio-economic class refines the foregoing findings. Let us start with the parents’ levels of instruction. Almost 40% of the fathers and 30% of the mothers were college graduates. Inversely, 15% of the fathers and 16.5% of the mothers did not have a secondary school education. The relationship between the type of schooling and the parents’ sociological profiles was important here, too, for the pupils in general education were much more likely to come from families in which the mother had a background in higher education than were the pupils in technical and vocational education. 6 Cramer’s V = 0.377, (sign. <0.001). 7 Cramer’s V = 0.341 (sign. <0.001). 4Social status as determined by the parents’ level of education thus remains a structurally determining factor when it comes to the student’s choice of schooling. It appears that the self-definitions of the socio-economic classes to which the students belong hide the objective situation that is measured by the mother’s level of instruction. Examination of the data confirms the continuity of social inequalities down through the generations. The mother’s scholastic career clearly had an effect on the child’s scholastic itinerary, as Table 1 shows, for 76.5% of the children whose mothers had no education were in technical and vocational education, whereas 87% of the children whose mothers had college educations were in general education. Moreover, 80% of the children whose mothers had non-university higher educations were also in general education. This intergenerational socio-economic immobility in our corpus is statistically significant6. In addition, there is a strong correlation between the mother’s level of instruction and ethnic background7: 69.7% of the mothers of students with two “native” Belgian parents had higher educations (college or non-college) compared with 28.5% of the mothers of students whose two parents were of foreign background. This confirms the marked superimposition of the socio-economic class and ethnic background in Brussels. 8 Cramer’s V = 0.336 for the father’s status and 0.382 for the mother’s status (sign. <0.001). 5Examination of the parents’ socio-occupational status also confirms the weight of socio-economic background in determining the student’s academic choices. The majority of the students’ parents were in salaried employment: 52.4% of the fathers and 53% of the mothers. Nine percent of the fathers were unemployed compared with 7.5% of the mothers whilst 24% of the mothers were homemakers. 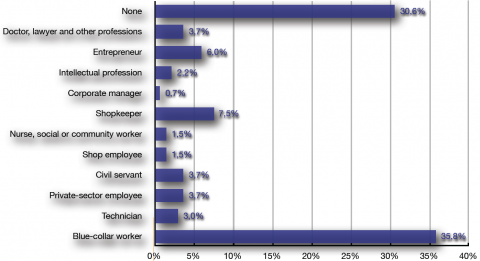 Many of the fathers (27%) were self-employed. The breakdowns by the pupil’s type of education are highly differentiated, however, and the differences are significant for the status of the father and mother alike8. The proportions of non-working parents were markedly higher among the parents of the pupils in technical and vocational education: 18.4% of the fathers and 14.3% of the mothers were unemployed. Similarly, the percentage of mothers who were homemakers was higher (42.2%) for the pupils in technical and vocational education. 6The father’s profession also confirms the impact of socio-economic class on the student’s type of schooling (Figures 1 and 2)9. The fathers of close to 10% of the pupils in general education were blue-collar workers, whereas this figure rises to 35.8% for the pupils in technical and vocational education. In a school system marked by perfect social mobility, the percentages should be the same for the two types of education. This is clearly not the case. Social or socio-economic diversity is practically non-existent in technical and vocational education. 7Social differentiation within the various forms of education can also be verified, often with statistical significance, by analysing another variable, namely, the existence of specific items reflecting a comfortable living standard, or affluence, in the home and personal possession of certain consumer products. The pupils in general education were more likely to have a library, works of art, newspapers, and an ADSL connection at home. To use Bourdieu’s (1979) terminology, they have an advantage in terms of their “cultural capital”, which can help them in their scholastic careers. They also tended more often to have a garden, garage, and open fireplace in the home, which are all indicators of economic capital. We also see a major difference when it comes to the presence of a telephone (landline) in the home: fixed telephony is much less common in the families of the pupils in technical and vocational education, confirming the hypothesis that the absence of a landline may be indicative of economic shakiness (Jacobs and Swyngedouw, 2000). In contrast, all of the families have a similar tendency to have a hi-fi system and various new products linked to television viewing (flat screens and home cinemas). 8Many of the students had their own items of mass consumption: 75.2% had a hi-fi system, 73.3% their own library with novels, 59.1% a PC, 73.1% an MP3 player, 56.4% a diskman, 70.7% comic books, 39.9% a digital camera, and 49.1% their own telly. Almost all of the students (97.4%) had their own cell phones. Here, there are significant differences between the pupils in general education and those in technical and vocational education. A much higher percentage of the former had their own libraries and comic books. However, there was no difference when it comes to owning a computer. Still, ADSL Internet connections were much more common for the pupils in general education. Finally, one last consumer item was found in a significantly higher percentage amongst the pupils in technical and vocational education than amongst those in general education, namely, their own television sets. The differences in the distribution of private effects amongst the pupils reveals elective affinities between items of mass consumption owned by young people in general education and the school’s cultural expectations that can only widen the gap between the forms of education. Whereas our sample was confined to a limited territory, that of Brussels’ central borough, and a single educational network that was assumed to work with similar enrolment mechanisms throughout, the type of schooling that the students choose seems to be strongly determined by the students’ socio-economic ties. The parents’ levels of instruction and professions continue to play major roles in choosing the type of secondary education. The challenge of democratising education is still on the agenda. In light of recent surveys using the findings of PISA tests, for example (Lafontaine et al., 2003; Dupriez and Dumay, 2004; Jacobs et al., 2007), and new data about school “catchment areas” (Delvaux et al., 2001), social inequality seems to continue to be perpetuated as scholastic inequality. 10 Significantly higher: Cramer’s V: 0.108, (sign. <0.01). 9The Brussels-Capital Region took in huge waves of immigrants after 1970. As a result, the composition of its school populations changed drastically on all levels of education in the space of just twenty-five years. This change is borne out amply by the composition of the school populations in Brussels-City (i.e., Brussels’ central borough). Whilst most of the students in our survey (85.3%) were born in Belgium, a sizable proportion (14.7%) was born abroad, mainly in Congo (3.3%) and Morocco (1.3%). The proportion of students born abroad was higher in technical and vocational education (21.4%)10 than in general education (12.7%). Although the overwhelming majority of the students were born in Belgium, many of the latter were of foreign descent. In slightly more than half of the cases, their mothers were born abroad (50.7%). The leading countries from which the students’ mothers came are Morocco (16.7%), Congo (9.7%), and Turkey (3.3%). The findings are similar for their fathers, only 49.7% of whom were born in Belgium. The proportion of students whose mothers came from a European country is very small. However, it is higher if we look at the preceding generation, that of the grandparents. Here, too, the differentiation by type of education is marked. Slightly more than 40% of the mothers and fathers of the pupils in general education were born abroad, compared with more than 80% of the parents of the pupils in technical and vocational education. The long-established tendency for children of foreign descent to be over-represented in technical and vocational education is thus borne out. Despite the large proportion of pupils of foreign descent in these schools, most of them (87.5%) are Belgian citizens. 12 Cramer’s V = 0.235 (sign. <0.001). 10We also looked at the link between foreign descent and identifying with an immigrant community. In response to the question, “Do you consider yourself a secondgeneration immigrant?” [The exact French wording “issu de l’immigration” is best equated with “second-generation immigrant” ‑ translator’s note], 24% of our respondents said “Yes”. It remained to be seen who considered themselves to come from immigrant stock. To answer this question, we constructed two categories: Belgo-Belgians and non-Belgo-Belgians11. Whilst 51.8% of the non-Belgo-Belgian students considered themselves to be second-generation immigrants, 48.2% of this same group did not want to be classified as such. Similarly, one of five respondents considered themselves to come from immigrant stock although they did not seem to be of foreign descent, at least not as recorded in our survey. Having foreign citizenship or being of foreign descent thus was not necessarily the same thing as considering oneself to be a second-generation immigrant. The students whose parents were European nationals, came from surrounding countries, or came from the Mediterranean basin were less inclined to identify themselves as second-generation immigrants. The students who were born outside Belgium12 and the young people with two foreign-born parents were more strongly disposed to identify themselves as second-generation immigrants. 11The difference in the inclination to assert this tie was also associated with the type of school attended. Given that the pupils whose parents were born abroad were more numerous in technical and vocational education, it comes as no surprise that this identity was asserted more strongly in conjunction with this type of education (36.8%) than with general education (20.7%). However, the difference in this subjective assertion is smaller than the one that appears for the “objective” indicator of the parent’s place of birth. Some pupils refused to declare themselves second-generation immigrants, especially in technical and vocational education. As we have noticed with regard to candidates for elections to the Brussels Parliament (Jacobs et al., 2006, p. 109), upwardly mobile people tend to assert their ties with the history of migration more. Inversely, in situations where such ties are a stigma, such as in technical or vocational education, more people turn their backs on them. This shows the plasticity of the use of immigrant identity. Immigrant identity is mobilised more frequently by pupils who are succeeding in school or climbing the scholastic ladder because this identity is both a source of recognition and a register of justification in line with the prevalent talk about scholastic meritocracy. Inversely, resorting to this way of presenting oneself would be tantamount to doubling the stigmatisation of a “scholastic backwater” that is associated with vocational education and training. Fewer pupils in general education (18.8%) answered the question, “Do you think that the others consider you a second-generation immigrant” affirmatively, whereas more pupils in technical and vocational education (45%) said that the others often considered them to be second-generation immigrants. Being of immigrant stock seemed to be less an identity to take on, perhaps even less of a source of pride, for the pupils in technical and vocational education than for the pupils in general education. This discordance attests to the pejorative connotation and onus of the formula “second-generation immigrant”, especially for pupils in technical and vocational education. The meaning that this qualification can take on thus is not independent from the social situation in which it is used. 13 Cramer’s V = 0.143 (sign. <0.001). 12Even in a country such as France, where ethnicity and race are used little in the various ways of identifying affiliations, many studies (Lorcerie, 2003; Felouzis et al., 2005) have revealed the ethnicisation of social relations both around and inside schools. In Francophone Belgian research, the question of the ethnicisation of social relations between young people and in school has also become the subject of studies and questions over the past few years (Martiniello, 1997; Rea, 2001; Verhoeven, 2002). In our survey we asked a number of questions designed to measure attitudes towards racism. One of them presented a series of propositions and asked the students to indicate the ones to which they felt closest. These propositions, and their scores, were “human races do not exist” (49.3%), “all races are equal” (44.3%) and “some races are more gifted than others” (6.3%). Close to half of the students rejected the idea that races existed, from which we could assume that there were few explicit racists among them. Nevertheless, 44% asserted that races did exist, but that they were all equal. This is a positive evaluation of otherness, but obviously rests upon the presupposition that races truly exist. The pupils in technical and vocational education were more of the opinion that “all the races are equal”, whereas the pupils in general education tended more to say, “human races don’t exist”. The differences were statistically significan13. This difference might also be explained by the degree to which the pupils assimilated the legitimate school discourse. Indeed, school conformism is more affirmed in general education, as are all the manifestations of school hypercorrectness (Beaud, 2002). Pupils in general education tend to internalise their teachers’ recognised legitimate discourse more deeply and echo them more frequently. 14 Cramer’s V = 0.125 (sign. <0.01). 15 This means that non-Belgo-Belgians may hurl racist insults at non-Belgo-Belgians. 16 Cramer’s V = 0.210 (sign. <0.001). 13We also strove to measure the occurrences of racist insults and actions. For the sample as a whole, 42.8% confirmed that they had already been on the receiving end of racist insults. For the most part the butts of such slurs were the pupils whose parents were born abroad14. Nevertheless, many pupils with Belgian-born parents said that they, too, had been the targets of such insults. Insults were made by other students (52.3%), shopkeepers (23.6%), police officers (19.8%), teachers (17.7%), bouncers (11.7%), security guards (10.9%), or mass transit inspectors (7.9%). The people making the insults were Belgo-Belgians in 53.7% of the cases and non-Belgo-Belgians in 62.6% of the cases15. This finding is surprising. People of foreign descent are not the only ones to feel themselves to be the targets of racist insults and Belgo-Belgians are not the only guilty parties. This corroborates the information collected by some qualitative surveys (Rea, 2001) in which some second- generation Moroccan immigrants called a French-speaking Belgo-Belgian youth a “Fleming”. For the latter, being called a “Fleming” could be equated with a racist insult. The pupils in general education were significantly16 less likely to be the targets of racist insults. Where populations of foreign descent and relegation to less prestigious educational tracks (e.g., VET) are concentrated (Vienne, 2003), the verbal exchanges that are also expressed in the form of verbal jousting or “ritual exchanges of insults” (vannes référencées) (Lepoutre, 1997), more commonly take the form of verbal assaults, which are so many forms of differentiation of identities. 17 Cramer’s V = 0.183 (sign. <0.001). 18 Cramer’s V = 0.095 (sign. = 0.05). 14Whilst 42.8% of the students said that they had been the victims of racist insults, 14.6% said that they had been the victims of racist actions (harassment, physical violence, or discrimination), committed by other students (34.7%), shopkeepers (15.6%), police officers (21.6%), teachers (17.7%), bouncers (14.4%), security guards (13.5%), or mass transit inspectors (13.4%). The “assailants” were Belgo-Belgians in 42.6% of the cases and non-Belgo-Belgians in 59.2% of the cases. The pupils in general education were less involved in racist actions than the pupils in technical and vocational education, or even those in fine arts17. Those who had at least one foreign-born parent and those who had two foreign-born parents were slightly more likely to have been the victims of racist actions than those whose two parents were born in Belgium18. 19 Cramer’s V = 0.163 (sign. <0.001). 15These results are difficult to interpret because the feeling of having been the victim of racist insults or racist actions is not a stable variable and we did not have multiple questions on the subject. Nevertheless, this survey shows clearly that racist victimisation is not restricted to second-generation immigrants alone. Some Belgo-Belgians also said that they had been the victims of racism, of “reverse racism”, we might say, by ethnic minority groups. Moreover, a large percentage (79.5%) of our respondents agreed with the proposition “some people of foreign descent are racist towards Belgo-Belgians”. However, the young people who had two or at least one Belgian-born parents were slightly, but significantly19, more likely to agree with this proposition. So, a feeling of “reverse racism”, i.e., racist attitudes by minority groups towards the majority group, exists within groups that are traditionally considered to be potential producers of racist insults. If we look at the answers to the question “Have you already made a racist insult?”, we see that 17.9% of the students answered affirmatively. The targets of these insults were above all students (49%). Sixty-five percent of the insulters stated that the insults were usually aimed at “foreigners”, but one of four insulters (26%) said that the targets were Belgo-Belgians. 16What subtends these expressions of racism? Some of the prejudices of which they are made produce and effectively reproduce distrust. We tried to identify the relationships of mistrust between ethnically or religiously defined groups. Against what was the distrust directed? We asked the following question, “Do you distrust people belonging to the following cultural and religious groups (never/seldom/ often/very often)?” The students said that they were the least distrustful of “Frenchspeaking Belgo-Belgians” (3.9%), “Asians” (5.1%), “Catholics” (5.9%), and “non-believers” (5.9%). The degree of distrust increased for “Africans” (9.8%), “Jews” (9.8%), “Poles” (11.7%), and “Dutch-speaking Belgo-Belgians” (12.4%). The maximum degrees of distrust were garnered by “Turks” (18%), “Muslims” (21.5%), and “Moroccans” (26.9%). This hierarchy corroborates studies that documented the social construction of a particularly stigmatised group on the basis of two variables, namely, ethnic origin and religion, in this case, the descendents of Moroccan and Turkish immigrants. 20 Cramer’s V = 0.104 (sign. <0.005). 17On another register, the Belgo-Belgian students had a markedly stronger tendency than the non-Belgo-Belgian students to subscribe to the following proposition: “To be fully accepted by society, people of foreign origin must give up certain cultural practices.” Inversely, the students with two foreign-born parents agreed with the proposition: “Some Belgo-Belgians do not want people of foreign origin to become full-fledged members of society”20. As we see, the question of otherness does not boil down to practices of rejection or sidelining. It refers to a deeper process, that of recognising others. The denial of such recognition is still strongly perceived in the group of non-Belgo-Belgians, even though these young people have Belgian citizenship. Like the relations that are forged between established groups and groups of outsiders that Elias has analysed, the matter of recognition here is not one of law, but of the social and symbolic legitimacy of people who are still suspected of wanting to escape obligations of cultural conformity. 18These various elements show that the social relations between young people are also coloured by identity struggles that can take the form of racializing expressions and practices, although we must point to the absence of all explicit assertions of racist identity among these young people. There is no doubt that the ethnicisation of social relations is present in the ordinary classifications and fuels the fighting between ethnically composed groups. Of course, one must take care not to consider this reading of certain relations between young people to be natural; nor should one deny it. 19The majority of surveys on juvenile delinquency are built around officially registered data. To become an offence, a deed must first be visible, and then be the subject of a referral or expulsion. The social inequality in this reportability has long been established, especially for young people (Chamboredon, 1971). Its criminal inequality is rooted in, amongst other things, the selective processes of police and judicial mechanisms as well as the neutralisation mechanisms that are used by the players who have effective resources for implementing them (Becker, 1985). Studies of victimisation and “unregistered” delinquency, which is grasped via self-revelation, are more recent. In this survey, we strove to measure both victimisation and self-revealed delinquency. 21 Cramer’s V = 0.148 (sign. <0.005). 22 Cramer’s V = 0.148 (sign. <0.005). 23 Cramer’s V = 0.160 (sign. <0.001). 24 Cramer’s V = 0.170 (sign. <0.001). 25 Cramer’s V = 0.152 (sign. <0.005). 26 Cramer’s V = 0.123 (sign. <0.01). 20Four out of ten students (41.4%) stated that they had been the victims of violent acts. Boys (50.7%) were confronted more with such violence than girls (33.6%). Five out of ten students (53.7%) stated that family members or friends had already been the victims of violent acts. For the sample as a whole, 30% of the students had already been the victims of a physical assault. The students with at least one foreign-born parent had the greatest likelihood of having been the victim of a physical assault21. Racketeering was the most widespread phenomenon among the young people, affecting 14% of the entire sample, with the following breakdown: 14.7% in general education, 9.1% in technical and vocational education, and 25.9% in fine arts. Relatively few of the students (6.5%) reported having been the victims of sexual assaults. On the other hand, the percentage was higher (10%) when the victims were friends or family. The pupils in the fine arts academy seemed to be more victimised than the others: They were more often the victims of assault22, thefts of items of value23, moral harassment24, destruction of personal effects25, and racketeering26. The explanation may have to do with the often valuable items that they need for their studies, which make them more likely targets of envy. 27 Cramer’s V = 0.121 (sign. <0.05). 22The results confirm those of earlier studies of this subject. Boys committed the majority of the criminal acts. Some 44% of the students said that they had done shoplifting, with no difference between general education and technical and vocational education or according to the parents’ places of birth. Twice as many boys (50.9%) as girls (38.6%) had engaged in shoplifting. About 20% of the students said that they had stolen someone’s personal effects, without there being any difference by type of education or place of birth of the parents. Once again, boys (28.1%) committed such thefts more often than girls (12.6%). About 26% of the students had already taken part in a fight (physical assault), likewise without a difference by type of education. However, students who had at least one foreign-born parent and those who had two foreign-born parents were slightly over-represented in this category27. As usual, boys (40.2%) got into fights more than girls (15.2%). As for the other illicit acts, 13.7% of the boys and 4.7% of the girls had sold drugs, 5.3% of the boys and 1.2% of the girls had engaged in racketeering, 30.9% of the boys and 11.4% of the girls had engaged in moral harassment, and 27.8% of the boys and 10.9% of the girls had committed vandalism. Only when it came to stealing from a family member did the girls have a higher percentage than the boys, although the difference between the two was not statistically significant. Finally, 47% of the students who had been the victims of violent acts said that the experience had prompted them to change their behaviour and 27% had started to avoid certain places. 23The seriousness of the situation that these data reflect must be interpreted with relative caution, given that we did not ask if these offences had been committed once or repeatedly, nor did we ask when the acts had taken place. So, our data do not establish the criminologist’s classic distinction between fleeting delinquency linked to adolescence and persistent delinquency. Our small sample and limited questionnaire length likewise did not enable us to test any theories that we might have about the determinants of the young people’s decisions to act. According to our data, reported delinquency was seen in all socio-economic categories and in all types of schooling, albeit much more markedly for those in fine arts. The main characteristic of the phenomenon is that the great majority of the perpetrators are male28. 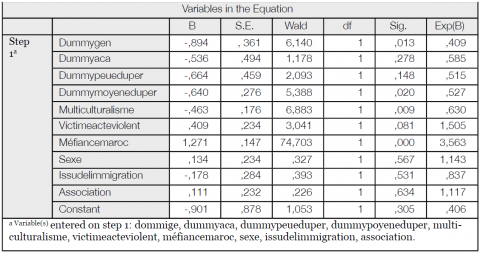 24In order to gauge the prejudices that surround fear of crime, we wanted to know if fear of crime (summarised as “apprehensions” in the table below) was associated with a specific group. Table 6 shows that Moroccans are associated most often with fear of crime: by 44% of the pupils in general education, 38.8% of the pupils in technical and vocational education, and 58.2% of the pupils in the academy of fine arts. Unsurprisingly, we found that the students who were themselves of Moroccan descent were much less inclined to connect this fear of crime with Moroccan origins. 25If we drop the students of Moroccan descent from our analysis, we see that this prejudice against Moroccans is less widespread in general education than in technical and vocational education. We tried to identify the variables that led to this association by including several questions covering a variety of objects in the questionnaire and then subjecting the multiple outcomes to logistic regression analysis29 (Table 7)30. 31 The regression coefficients are too low and significance values too high for these variables. 26Neither gender nor belonging to an association, nor even ethnic origin could explain the difference between those who associated Moroccans with crime (fear of crime or “apprehensions”) and those who did not.31 The respondents who were in general education were less likely to associate the variables “Moroccan” and “fear of crime” than those who were in technical and vocational education. The variable with the greatest predictive strength was the degree of mistrust of Moroccans. However, since this variable belongs to the same sphere of prejudices, it is not satisfactory enough to be explanatory. In contrast, multiculturalism is an asset” helps to dissociate “fear of crime” and “Moroccans”. This element shows the weight of beliefs and cognitive dimensions in the construction of stereotypes (Klein and Pohl, 2007). 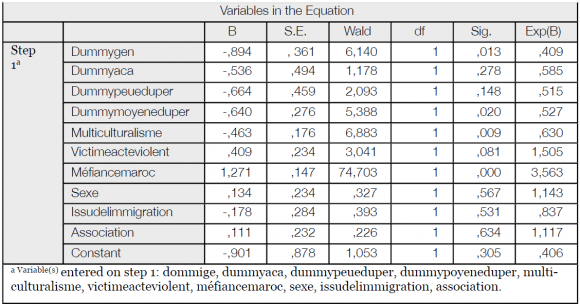 When we controlled for the effects of all the other variables in the model, including the type of education, we found that those who had fathers with higher educations had a greater tendency to associate “fear of crime” and “Moroccans”. 27This survey of young people in Brussels’ secondary schools provides various elements for analysing the “problems” of youth. Above all, it reminds us that the younger generation is not monolithic (Nagels and Rea, 2007). It confirms some longstanding major trends. Socio-economic class continues to determine the choice of schooling in secondary education. The least affluent socio-economic classes continue to provide the bulk of the pupils in technical and vocational education. The mother’s academic itinerary becomes an important variable in the differentiation of the choices of type of schooling. In a city such as Brussels, this social determinant is compounded by an ethnic determinant, which is grafted onto the former. Our survey also highlights some more recent problems, such as xenophobia and fear of crime. Racializing practices, especially verbal ones, were found to be very widespread. They are directed at not only the traditional groups, i.e., secondgeneration immigrants, but also at people belonging to the majority ethnic groups. Inverse racism was thus revealed. Another finding was that immigrants often engage in racism towards other immigrants. Racist remarks are common, even though subscribing to antiracist discourse appears to dominate the picture. From this point of view, our findings attest that the relations amongst young people are built on identities that are rooted in references to socio-economic class and ethnic origin, but their intensity varies with the type of education. The ethnicisation of the young people’s social relations seems to be very widespread and is even used when they talk about crime and fear of crime, especially with regard to a specific group, namely, young people of Moroccan descent. 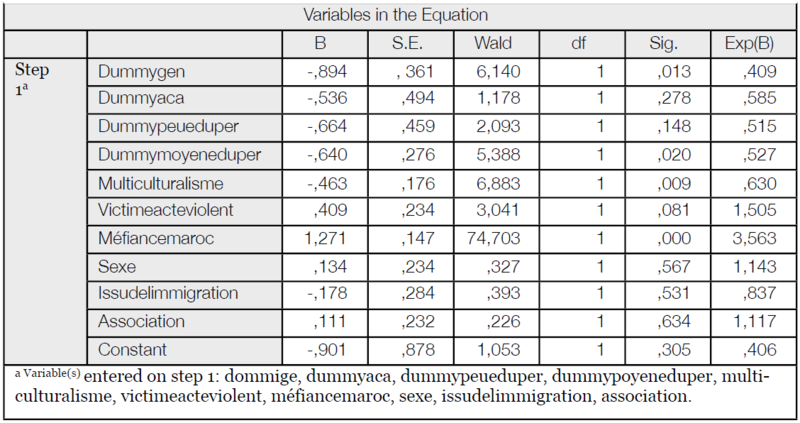 Yet the self-reported delinquency responses show relatively few differences between groups of different origins (after controlling for other variables, such as socio-economic position). The young people’s prejudices regarding lawlessness and fear of crime thus seem for the most part to be the result of dominant representations that participate in a generally shared reference system. This survey yields a series of analytical findings that in turn generate a myriad of questions calling for further investigation. We should like to thank the Deputy Mayor for Public Instruction of the City of Brussels, Faouzia Hariche; Education Inspector M. Boumal; and the schools’ managements for having made this survey possible. This research had financial support from Brussels-City. This survey was carried out by the following sophomores in sociology as part of their practical work at ULB: N. Berger, T. Casale, A. Dumoulin, M. Ergen, S. Fortuna, F. Houyoux, M. Istasse, N. Jebbar, I. Khiri, D. Kiedrzynski, S. Lempereur, J.-P. Merveille, S. Ntwa, N. Nyst, M. Openheimer, C. Petrano, S. Sarkosi, K. Sarot, A. Schreiber, R. Shojai, E. Stockman, Y. Teke, B. Trefois, L. Vogiazides, and T. Wallemacq. We would like to thank the reviewers and editors of Brussels studies. We would equally like to thank Brussels studies for the translation of the original text in French into Dutch and English. BEAUD, S. (2002), 80% au bac… et après ? Les enfants de la démocratisation scolaire, Paris, La Découverte. BECKER, H. (1985), Outsiders, Paris, Ed. Métaillé. BILLIET, J. and WAEGE, H. (Eds.) (2001), Een samenleving onderzocht. Methoden van Sociaal- Wetenschappelijk onderzoek, Antwerpen, Standaard Uitgeverij. CHAMBOREDON, J.-C. (1971), “La délinquance juvénile, essai de construction d’objet”, Revue française de sociologie, XII: 335‑377. DELVAUX, B., DEMEUSE, M., DUPRIEZ, V., FAGNANT, A., GUISSET, C., LAFONTAINE, D., MARISSAL, P. and MAROY, C., Les bassins scolaires : de l’idée au projet. Propositions relatives aux domaines d’intervention, aux instances et aux territoires, Recherche financée par la Communauté française, Rapport final, juillet 2005. DUPRIEZ, V. and DUMAY, X. (2004), “L’égalité dans les systèmes scolaires : effet école ou effet société ?”, Les Cahiers de Recherche en Education et Formation, 31. ELIAS, N. (1997), La logique d’exclusion, Paris, Fayard. FELOUZIS, G., LIOT, F. and PERROTON, J. (2005), L’apartheid scolaire : Enquête sur la ségrégation ethnique dans les collèges, Paris, Seuil. JACOBS, D. and SWYNGEDOUW, M. (2000), “Een nieuwe blik op achtergestelde buurten in het Brussels Hoofdstedelijk Gewest”, Tijdschrift voor Sociologie, 21 (3): 197‑228. JACOBS, D., HANQUINET, L. and REA, A. (2007), Performances des élèves issus de l’immigration en Belgique selon l’étude PISA : une comparaison entre la Communauté française et la Communauté flamande, Bruxelles, Fondation Roi Baudouin. http://www.kbs-frb.org/files/db/FR/PUB_1665_E%26JA_PisaFr.pdf (consulted on: 03 July 2007). JUGER-TAS, J., TERLOUW, J., KLEIN, M. (1994), Delinquent Behaviour among Young People in Western World, Amsterdam/New York, Kluger. KESTELOOT, Ch. and WALGRAVE, L. (2000), Verstedelijking, sociale uitsluiting van jongeren en straatcriminaliteit, Brussel, D.W.T.C. KESTELOOT, Ch., VANDERMOTTEN, Ch. et al. (2001), Structures sociales et quartiers en difficulté dans les régions urbaines belges, Bruxelles, KULeuven et ULB, SPF Politique des grandes villes. KLEIN, O. et POHL, S. (Eds) (2007). Psychologies des stéréotypes et des préjugés, Bruxelles, Labor. LAFONTAINE, D. et al. (2003), “Les compétences des jeunes de 15 ans en Communauté française en lecture, en mathématiques et en sciences. Résultats de l’enquête PISA 2000”, Cahiers de Service de Pédagogie expérimentale, 13‑14. LEPOUTRE, D. (1997), Cœur de banlieue. Codes, rites et langages, Paris, O. Jacob. LORCERIE, F. (2003), L’école et le défi ethnique, Paris, INRP / ESF éditeur. MARTINIELLO, M. (1997), Sortir des ghettos culturels, Paris, Presses de Sciences Po. NAGELS, C. and REA, A. (2007), Jeunes à perpète. Génération à problèmes ou problème de générations, Louvain-la-Neuve, Academia-Bruylant. REA, A. (2001), Jeunes immigrés dans la cité. Citoyenneté et politique publique, Bruxelles: Labor. VERHOEVEN, M. (2002), École et diversité culturelle : regards croisés sur l’expérience scolaire de jeunes issus de l’immigration, Louvain-la-Neuve, Academia-Bruylant. VIENNE, Ph. (2003), Comprendre les violences à l’école, Bruxelles, De Boeck. WALGRAVE, L. and VERCAIGNE, C. (2001), “La délinquance des jeunes autochtones et allochtones à Bruxelles”, in BRION, F. et al. (Eds) Mon délit ? Mon origine. Criminalité et criminalisation de l’immigration, Bruxelles, De Boeck-Université, 77‑111. 1 Académie Royale des Beaux-Arts, Athénée Emile Bockstael, Athénée Robert Catteau, Athénée Léon Lepage, Athénée Adolphe Max, Lycée Daschbeck, Lycée Emile Jacqmain, Institut des Arts & Métiers, Institut Bischoffsheim, Institut De Mot-Couvreur, Institut Diderot, Institut Paul-Henri Spaak, Centre d'Education et de Formation en Alternance (Work/Study Centre). 2 A larger quantitative study is being conducted at GERME-ULB. It is being conducted by C. Teney, under the supervision of D. Jacobs, and financed by the Brussels-Capital Region (Prospective Research for Brussels Programme). It covers a sample of 3 171 pupils in the French- and Dutch-speaking schools (all school systems) in seven boroughs of the Region. 4 The terminology used in the questionnaire undoubtedly introduced some bias. We should have preferred the expression “working class” to “lower class”, which carries a negative connotation. We can assume that some pupils were reluctant to identify with a so-called “lower” class. 9 The category “none” includes the unemployed, (pre-)retired, disabled, and those who depend on public assistance. 11 We use these two analytical categories to distinguish the pupils’ ethnic origins on the basis of their legal parents’ ethnic origins. The non-Belgo-Belgians are pupils who have at least one parent who was born abroad. 28 Two explanations are traditionally put forward to explain this gender difference: the fact that female delinquency is less linked to scholastic problems and the fact that girls live in peer groups (Jurger-Tas et al., 1994). 29 In a logistic regression one examines which variables are more closely associated with the probability of the presence of a phenomenon to explain. The logic of a logistic regression is fairly comparable to that of a linear regression, but in the case of a logistic regression the dependent variable is not metric. In a logistic regression one examines which variables are more closely associated with the probability of the presence of a phenomenon to explain. The logic of a logistic regression is fairly comparable to that of a linear regression, but in the case of a logistic regression the dependent variable is not metric. 30 We used the following variables in the model: the type of education in which the pupil is enrolled (“dummygen” and “dummyaca” refer to the effect of being in general education or artistic education compared with technical and vocational education), the father’s level of education (“dummypeueduper” and “dummymoyeneduper” refer to the effect of the father’s level of education (little and intermediate, respectively), compared with a high level of education), appreciation for a multicultural society (“multiculturalisme”), having been the victim of violence (“victimeacteviolent”), the level of mistrust of Moroccans (“méfiancemaroc”), gender (“sexe”), coming from an immigrant background (“issudelimmigration”), and belonging to an association (“association”). The results are a -2 Log likelihood of 500.313 and a Cox & Snell R-squared of 0.256. Predication is improved from 50.1% (Model 0) to 72.3% (Model 1). Dirk Jacobs (1971). Associate professor at Brussels Free University (ULB), where he is a member of GERME. Author of many scientific articles on the integration of immigrants and their descendents that have been published in various international journals. He recent coauthored a study of the candidates in the regional parliamentary elections, Qui sont les candidats aux élections bruxelloises ? Le profil des candidats à l’élection au parlement de la Région Bruxelles-Capitale du 13 Juin 2004, “Cahiers Migrations” Collection No. 37, (Brussels: Academia-Bruylant), 2006. Andrea Rea (1959). Associate professor at Brussels Free University (ULB), where he directs the Sociology Institute’s study group on ethnicity, racism, migration, and exclusion (Groupe d’étude sur l’Ethnicité, le Racisme, les Migrations et l’Exclusion) or “GERME”. His recent publications include Immigration et intégration en Belgique francophone. Un Etat des savoirs with M. Martiniello and F. Dassetto (Louvain-la-Neuve, Academia-Bruylant, 2007) and Jeunes à perpète. Génération à problèmes ou problème de générations with C. Nagels (Louvain-la-Neuve, Academia-Bruylant), 2007.